Third quarter findings indicate middle market companies plan to expand payrolls over the next 12 months, even as revenue expectations weaken and broad economic concerns persist. The middle market overall continues to show a lack of confidence in the global and U.S. economies – highly concerned about health care costs, the ability to maintain margins, the cost of doing business and uncertainty regarding government actions. 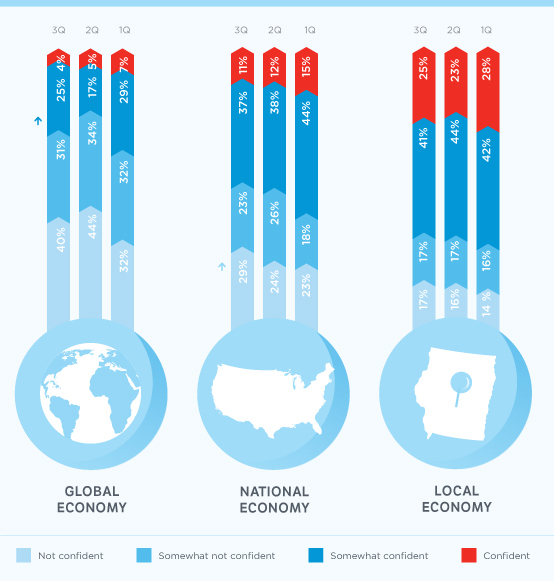 More than 70% of the middle market said they were not confident or somewhat not confident about global economic prospects. Concerns about the U.S. economy worsened slightly in the quarter; 52% of respondents said they were not confident or somewhat not confident about the domestic economic outlook, compared with 50% in the previous quarter. Middle market companies remain hesitant to invest additional cash, extending their habit of postponing investment opportunities. The number of companies who said they would hold cash dropped in the third quarter from 49% to 44%, providing a glimmer of hope that the middle market may start investing in capital expenditures, expansion or other areas that could fuel growth. 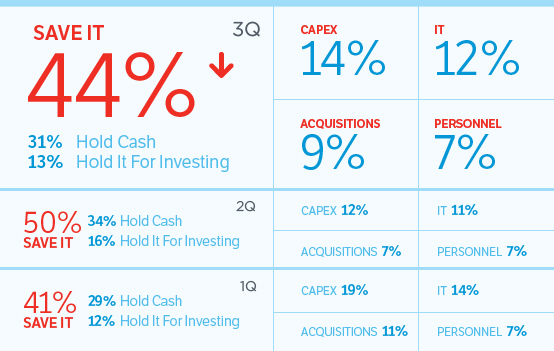 However, that number lags first-quarter results when 41% said they would hold excess cash. Middle market companies expect gross revenue to gain 3.7% in the next 12 months, a decline from second quarter expectations of 4.8% and 5.2% for 1Q expected growth. All revenue segments expect some decline and there was a sharp drop off in the number of firms expecting to grow more than 10%. Only 17% of all respondents in the survey said they expect double-digit revenue growth compared with 23% in the prior quarter, and 28% in Q1. 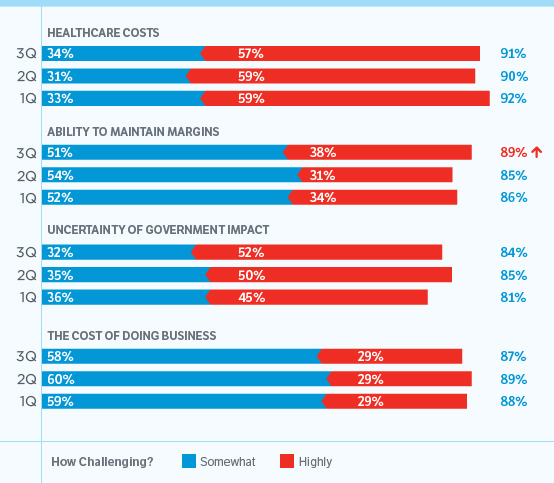 A large majority of leaders at middle market companies cited uncertainty about healthcare costs as their major challenge, a persisting concern as healthcare and other regulations remain in flux. The same concerns were highlighted in Q1 and Q2 surveys. In addition, middle market company leaders expressed a rising concern with their ability to maintain margins and the cost of doing business, indicating that they are having trouble and foresee difficulties in rising prices and passing on increased costs to customers.